Copyright © Kevin Ward & exceptionalminerals.com - This image is copyrighted. Unauthorized reproduction prohibited. 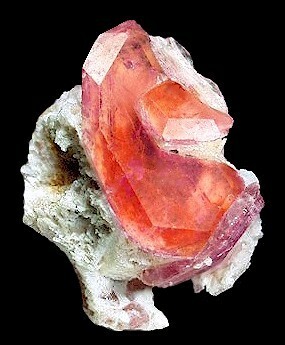 Exceptional specimen featuring a huge Pezzottaite crystal! with a deep reddish-pink color. It measures 2 cm in size from top to bottom! From Ambatovita, south of Mandrosonoro, Madagascar. Measures 2.6 cm by 2.1 cm on matrix.